I thought I'd share my testimonial with you regarding my Belgian Malinois Zula. She had emergency surgery this past Thursday for Pyometria. This is a picture of the incision. On Saturday she used her back paw and had dug at it causing it to bleed. It was bleeding through the day including Sunday morning. I cleaned it with distilled water and a couple drops of Providine iodine and a couple drops of peroxide using a cotton Baton after which I applied the silver shield gel I bought from your office. I kept on applying the silver gel throughout the day yesterday and today this is how nice the wound looks. The silver made a huge difference! I wish I had taken a picture of the before but I didn't. Feel free to use my testimonial. I'm very happy with the results ! All new report on how Silver is 100% effective against Malaria in Africa! http://silversol.soundconcepts.com/ Get the real scoop on what Silver Shield (silver sol) does! Silver Shield is safe because it's different! The picture on the left is of Dr. Pederson just after his accident. The picture on the right is 7 days after using Silver Sol solutions (Silver Shield). Injuries, wounds, infections and physical trauma all compromise the immune system inviting potential complications. The immune system focuses all it�s energy on isolating, destroying and removing a pathogen before tissue regeneration and healing can occur. Silver helps to destroy pathogens, reduce inflammation and pain and thus intensifies the healing process. Allowing such healing to occur, Dr. Pederson chose to not only use Silver Shield externally, but internally. He took 3 tablespoons of Silver Shield internally during the healing of his injuries while applying a soaked gauze pad to the injuries externally. Dr. Pederson, who developed this particular type of patented Silver states that the Silver must be in contact with the pathogen for a minimum of 6 minutes. Purchase Silver Shield and see for yourself how so many conditions are being helped by supporting the immune system in this safe and effective way. I�ve been taking Silver Shield daily for over 2 years to keep me from getting sick. I don�t personally do vaccines�give me Silver Shield instead! I don't get colds or flu even though many others around me do. (Dr. Mary Born)<?xml:namespace prefix = o ns = "urn:schemas-microsoft-com:office:office" />http://www.mynsp.com/born/products/guide.aspx?stockNum=4074 Silver Shield is patented for safety and can be used on a daily basis. My 6 year old came down with a stomach bug last week with a 103 temperature. He drank his fluids I gave him silver shield and he went back to school after two days and no temperature. I also used distress remedy for his aches and fever. I have used silver shield and ALJ for his viral infection due to sinus drainage and feel safe giving it to him.<?xml:namespace prefix = o ns = "urn:schemas-microsoft-com:office:office" />Thank you Mary and Natures Sunshine! "Total daily silver intake should not exceed 980 mcg/day for a 70 kg person (Natural Medicines Comprehensive Database, 2007, Therapeutic Research Faculty). Following labeled dosage instructions, Silver Shield provides 267 mcg of silver per day. This is well below the maximal daily dosage limit." Click above for the entire statement by Nature's Sunshine. Herpes has no chance against Silver Shield! Maybe you played �Blind Man�s Bluff� or a similar version of the game, �Marco Polo�. The game goes like this: someone is blindfolded or is �it� and has to guess where all the other players are. They can eliminate the other players one by one or announce, �your it�. Then a new person becomes the �Blind Man�. Sometimes I feel that our �medical care system� runs on the premise that all they have to do is keep bluffing us and distracting us and we�ll keep listening. For example: recently it was discovered that MRSA infections in hospitals is Ten Times what they previously thought. Researchers surveyed a total of 1,200 hospitals and other health care facilities from all 50 states, and found 8,000 patients infected or colonized with methicillin-resistant Staphylococcus aureus (MRSA) -- or 46 out of every 1,000. This suggests that up to 1.2 million hospital patients across the country may be infected every year. The advice is to wash your hands frequently. (The bluff!) The soap provided in hospitals has a strong disinfect and is capable of stripping the skin of most bacteria (good and bad). However, MRSA has shown to be very tough and is still on the rise. 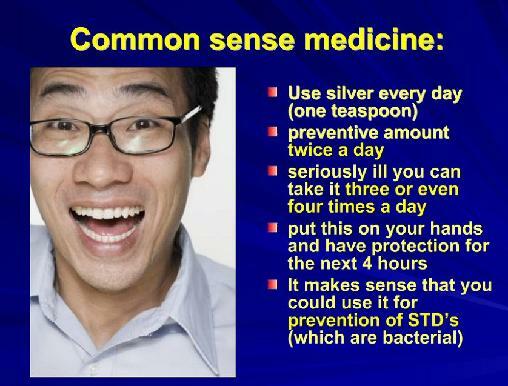 Natural Health people know that colloidal silver, specifically the safe use of Silver Shield, has shown to be effective against MRSA as well as other tough pathogens. Silver Shield is designed to keep on killing for up to 4 hours when used as a topical hand sanitizer. Put the above in a 4 oz. squeeze container, close and shake vigorously. This gel can be applied to hands to protect against bacteria, viruses and other harmful microbes. You can transfer to a smaller squeeze container for travel�make sure you label it: Hand Sanitizer. You can add Lavender, Lemon or peppermint to the gel for more appealing scent and germ fighting capabilities.